Clark and Miriam met at a Square Dance class in 1974, taking lessons from Dennis Marsh with the Tech Squares at MIT. Clark followed a family tradition of attending MIT and has earned his Bachelors, Masters, and Electrical Engineering degrees there, focusing on Computer Science. Clark and Miriam continued Square Dancing learning Advanced levels with John Sybalsky and later C3 and C4 with Norm Poisson. Clark and Miriam continue dancing with the Tech Squares and with their two classes a year, have actually learned to dance over 60 times. Clark started Calling and creating choreography in the late 70s. John Sybalsky, being his mentor, let him help out with the classes which led to Clarks Calling and teaching the Advanced and Challenge levels. Clark also credits Don Becks inspiration and guidance. Clark has gone on to Call all over the United States, in Japan, Sweden, and Germany. Clark is also a writer, writing and publishing The Challenge Square Dancing Handbook also writing the column Challenge Ramblings for the Northeast Square Dancer Magazine. Clark has been involved in the Leadership of the Square Dance activity right from the beginning, holding an office with the Tech Squares and the Tristate Callers Association. A member of CALLERLAB since 1980 he has served continuously, holding positions of Chairman of Research and Development, Chairman of Definitions, Coordinator of Quarterly Selections, Board of Governors, and Executive Committee. 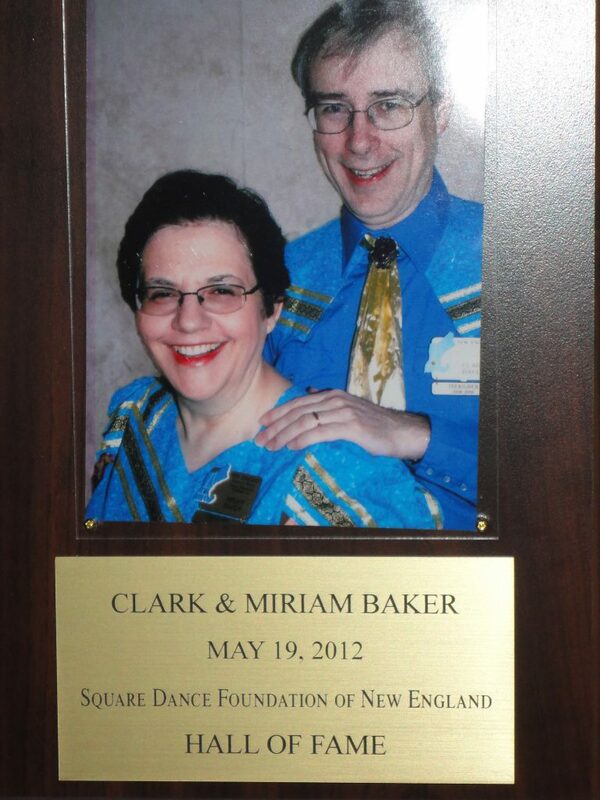 Clark and Miriam also served as the Treasurer for the 50th and 51st New England Square Dance Convention. This service covers a span of 30 years. Clark and Miriam have dedicated themselves to the Preservation, Promotion and Perpetuation of Square and Round Dancing in New England. They truly deserve being added to the Square Dance Foundation of New England Hall of Fame.